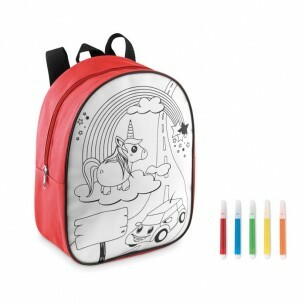 Combine the practicality of a bag with the fun of colouring in with this printed children's backpack. Made from 600D polyester to ensure it's durable and long lasting. It has a black and white picture on the back, and it comes with 5 markers so the owner can colour in the picture. Available in red or turquoise, the branded rucksack would be an ideal gift or promotional item for any company in the children's education sector. Print this product on the front (other positions may also be possible). Our backpack with 5 markerss are made from mixed and comes in red , turquoise. Our kids and games accessory items are printed in up to 8 colours via screen transfer print, which is a technique suitable for almost all backgrounds and shapes.